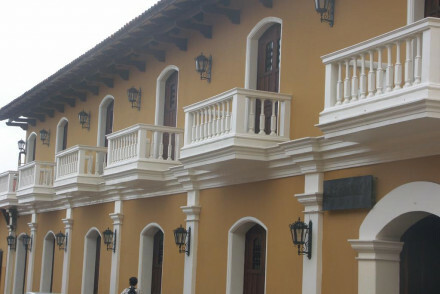 Elegant colonial beauty, Granada offers postcard worthy views at each turn of a corner. There are wonderful churches and pastel coloured buildings along cobblestoned streets. The best places to stay in Granada have often been converted from some of Granada’s best preserved and most beautiful colonial architecture. Granada is also a great base for exploring the local countryside, where you’ll discover a coastline of pristine, fun beaches, a spectacular clear turquoise lake, Lake Apoyo, and a volcanic interior complete with hot springs, walking trails and a butterfly sanctuary. Granada’s stunning highlights include the Iglesia La Merced, a dramatic landmark church built in 1534 with unmissable views from the bell tower. The lavishly turreted Fortaleza La Polvora, an 18th Century Spanish fortress providing spectacular views of the city. Relax in the Plaza of Independence, a beautiful and historic square where visitors can watch the world go by. Pay a visit to the Masaya Crafts Market with a great range of local crafts - it's certainly the perfect place to take in the local atmosphere and pick up a souvenir. Indulge your sweet tooth at the ChocoMuseo - learn about the historical element and see the process in action in the factory within the museum. The best places to stay in Granada range from chic properties in the centre ideal for exploring to luxurious island retreats - ensuring something for all. The Casa Lucia is a boutique hideaway in central Granada, with just five stylish rooms, a courtyard with a pool and tropical gardens. This is the perfect place to come to relax: a daily yoga class is included in the price of the room. Or if you want to explore Granada’s natural assets - here you can hike volcanoes, go surfing or kayaking on nearby Lake Apoyo, a deep blue crater lake which maintains a year round temperature of 30 degrees. La Gran Francia Hotel is a converted ancestral home in the centre of Granada. Colonial styled rooms feature dark antique furniture set against pastel hues. A central courtyard hosts a pretty pool. Find two restaurants serving excellent continental dishes. The ideal base for city exploring. 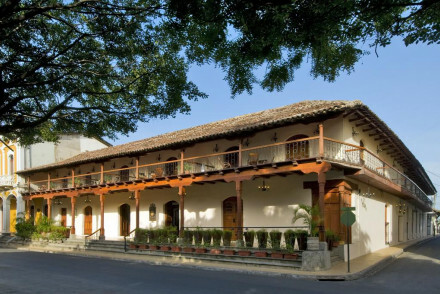 Centrally located, Hotel Plaza Colon is a boutique colonial property set around a picturesque central courtyard. Traditional rooms feature high ceilings, exposed beams and dark antique furniture. Indulgent breakfasts are served and the pool provides the perfect spot to unwind after a day exploring the city. Very chic. Ideal for couples, Los Paios is a small boutique property in the centre of Granada. Chic rooms are all white on white with minimalist style and large French doors leading onto leafy patios. Find utter tranquility in the central courtyard complete with pool or head to the spa for some serious pampering. A fabulous city base. 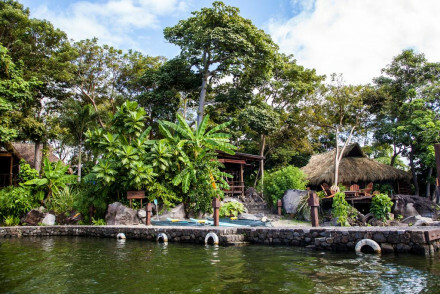 For a total escape, Jicaro Island Ecolodge is set on the remote Jicaro Island overlooking Lake Nicaragua, this lodge is a tranquil island paradise. Made up of nine delightful casitas, everything is tailored towards relaxation with an excellent spa and a floating yoga deck. Made for honeymoons and romantic getaways. If you'd prefer your own space, visit our online partner Booking.com for a variety of properties throughout the centre, ideal for city exploring. Fly to Augusto C. Sandino International Airport located 51km (31 miles) from Granada. The airport serves a range of both domestic and International destinations. Best time to visit - November to April - the weather tends to be dry and sunny with mild temperatures, great for exploring the city and other excursions. A converted ancestral home in the centre of Granada. Colonial styled rooms feature dark antique furniture set against pastel hues. A central courtyard hosts a pretty pool to unwind by. Find two restaurants serving excellent continental dishes. The ideal base for city exploring. 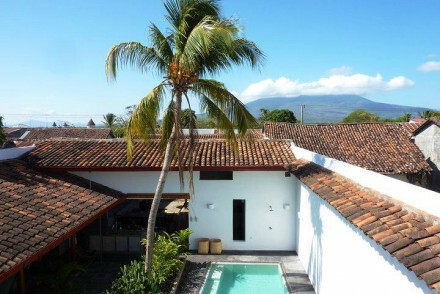 City Style - A chic colonial style property complete with courtyard pool and a renowned restaurant. Local markets - Wander to the Crafts Market and pick up some local artecrafts. Sights nearby - Just steps from the impressive Cathedral of Granada. A boutique hideaway in central Granada where you'll find a daily yoga session included in your room rate! 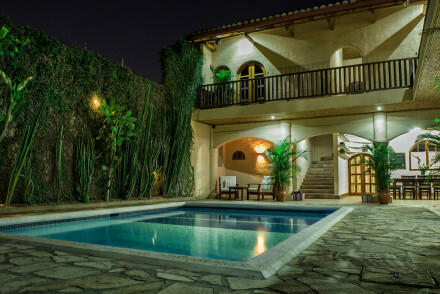 An intimate property with just five stylish rooms and suites, plus pretty courtyard with pool and tropical gardens. Loads to do from Volcano walks and surfing to practising your yoga moves! Surfing - Learn to surf with the experts on NIcaragua's Pacific coast. A boutique colonial property set around a picturesque central courtyard. Traditional rooms feature high ceilings, exposed beams and dark antique furniture. Indulgent breakfasts are served and the pool provides the perfect spot to unwind after a day exploring the city. Very chic. Local exploring - An authentic stay with easy access to the city's attractions. Eco break - A Rainforest Alliance Certified™ property. Sailing - Hire a boat and take a picturesque cruise through 'Las Isletas' made up of 360+ islands. Local markets - Pick up some local artefacts at the handicrafts market. A small boutique property in the centre of Granada. Chic rooms are all white on white with minimalist style and large French doors leading onto leafy patios. Find utter tranquility in the central courtyard complete with pool or head to the spa for some serious pampering. A fabulous city base. City Style - A chic boutique property complete with pool and elegant bar and restaurant. Sailing - Take a cruise on the picture perfect Cocibolca Lake. Set on the remote Jicaro Island overlooking Lake Nicaragua, this lodge is a tranquil island paradise. Made up of nine delightful casitas, everything is tailored towards relaxation with an excellent spa and a floating yoga deck. Made for honeymoons and romantic getaways. Romantic Break - Set on a beautiful remote island with lovely luxurious cabanas, perfect for couples. Back to Nature - Immerse yourself in the natural environment of the Granada Isletas. Fishing - The lodge can organise sea fishing trips for guests. Birdwatching - Superb birdwatching on the Isletas de Granada.